At Lighthouse Point, which marks the entrance to Big Tub Harbour near Tobermory, Ontario, the Big Tub Lighthouse watches over the waters of Lake Huron which have known to be extremely treacherous at times. 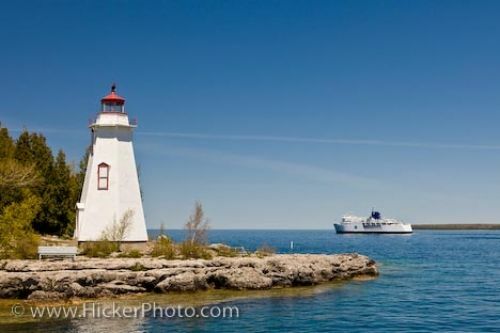 A boat passes by the lighthouse on a beautiful sunny day when the waters of Lake Huron remain calm. First built in 1885, the Big Tub Lighthouse has been replaced once by the 43 foot one that stands at this point today. A pathway leads visitors to the lighthouse where they can learn of the marine history of the area and enjoy the beautiful scenery of the harbour. Picture of a boat on Lake Huron passing by the Big Tub Lighthouse at the entrance to Big Tub Harbour in Tobermory, Ontario.